Let's Talk Pinterest for Tourism with Dream.Pin.Go. Dream.Pin.Go. helps travel brands develop a long-term Pinterest strategy for all stages of the travel buying cycle. My name is Nienke Krook and in weekly blog posts, newsletter and a Pinterest mini-course, I am excited to finally share with you my years of experience consulting travel brands and public speaking on the topic of Pinterest for business. Pinterest is a visual bookmarking tool. Organised in self-categorised ‘boards’, users 'pin' visual content from around the internet. This content is then visible to other users and can be shared or bookmarked again with just a click. Bookmarking is one of the fastest methods for internet users to organize, share, and manage online content. It helps tourism businesses in becoming more visible and searchable by consumers. Because every 'pin' creates a backlink to the original source, businesses find traffic coming to their websites for months or even years after the original pin was placed. Tourism marketing has always been highly visual and that proves to be useful when using platforms such as Pinterest. Visual content make dreams tangible: you can almost see yourself in a destination, taking in landmarks, dining at restaurants and experiencing the local attractions — all those things that will end up on a customer’s travel itinerary. The power of Pinterest lies not just in the ability to drive traffic to your company website, but it also opens a window into the travel aspirations of the consumer. As content on Pinterest is not reflective of the current moment, but rather the future, there is a huge opportunity to connect with customers at key moments in their travel buying cycle. I'm so excited that you are interested in building a Pinterest presence for your business. And the good news is, you can get started with that right now. In this 10-part tutorial, I will talk you through everything you need to know about the use and set-up of Pinterest and I will show you how to prepare your account for success. Download my free ebook, featuring 210 board ideas specifically for the tourism industry, and also receive my regular newsletter with Q&A's, updates on events, products, blog posts and new Pinterest features. Signing up will also give you access to the Dream.Pin.Go. secret resource library, where you'll find slides to past presentations, links to handy tools and other practical Pinterest tips & tricks. Only accessible to newsletter subscribers! BECOME PART OF TEAM DREAM.PIN.GO. 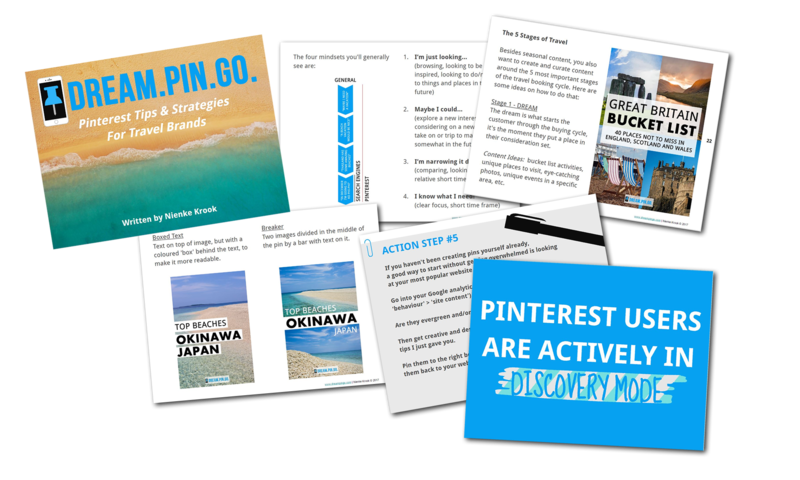 Whether you’re a destination marketeer, tour company, travel service provider, blogger or any other business with readers and customers looking to explore the world, this Pinterest mini-course is made for you. In clear, step-by-step instructions, I will take you by the hand and help you get started with Pinterest. Jump-started, really, because by using a specific content strategy from the beginning, you will see both immediate results as well as long term benefits all within the same effort. I hope you find all resources on this site helpful in setting up your own Pinterest account. Please let me know were I can find you and don't forget to head over to the blog section to read the most recent Pinteresting updates.